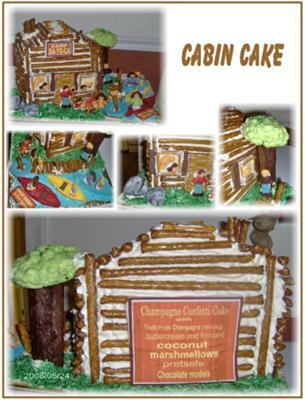 I made this cabin cake to raise money for children to go to camp. I made four square confetti cakes and filled them with trutti-frutti filling. I added vanilla buttercream frosting and placed large and small pretzel sticks around it to make it look like a log cabin. children, the canoes, innertube, windows and shutters. I made the rocks out of candy clay and covered them with marbled fondant. The tree was made out of large marshmallows. I painted them with chocolate until they were thick enough. The topper was small marshmallows microwaved slightly to form the roundness and then I painted them with green chocolate, and applied a dowel stick to attach them to the tree trunk. I made the fire pit out of candy clay logs, small pretzel sticks, and the fire I made with yellow, orange, and red chocolate. The sign on the cabin I made with edible imaging. I used green coconut for the grass and blue buttercream for the water. I also made a catwalk out of buttercream and large pretzels. thanks so much, I've just gotten started making cakes and I am really having a good time with it. and for a great cause..
WHAT GREAT IDEAS YOU HAVE!!!!!!!!! !